This blog is part of our Digital Transformation series inspired by key highlights from the presentation, How to Reimagine and Reset Your Organization for a Digital Transformation. Shown at Emerging Horizon, the 2017 North Carolina Council of Community Programs Conference held in Pinehurst, NC, this presentation was given by Core Solutions CEO Ravi Ganesan. We’ve already discussed some of the big changes underway in behavioral health and the healthcare industry as a whole, and many smart business leaders are making an effort to survive and thrive through a forward-thinking, strategic growth mindset to anticipate, address and overcome these changes. Although not all organizations will manage change the same way, we can all agree that doing nothing is not an option—but neither is making the wrong decision. So how can we move forward with decisions that are right for our organization, our products and services and our team? We can start by unpacking perfection, the innovator’s obsession with getting things right the first time. When it comes to product development, first drafts and fresh ideas don’t always work out or lead us in the right direction. We may even waste time, money and energy seeing something through that ends up failing to resonate with or serve the needs of consumers, or we may forge ahead and attempt to be everything to everyone without considering our differentiators and special niches. The lean methodology suggests that instead of aiming for perfection, decision-makers and business leaders should begin by focusing on the minimum viable product (MVP). With the MVP approach, for any project that you undertake you should think big but start small. This gives you the opportunity to evaluate the potential success of a project much earlier in the process, determining its effectiveness in the first three months, not the first two years. Many successful companies stay away from the problematic goal of immediate perfection and instead operate from a more practical standpoint: experiment and fail fast, look for the minimum viable product and commit to continuous improvement to build upon that work and develop a more successful long-term solution. No provider of products and services wants their offerings to be considered merely “sufficient,” but when designing something great, starting out with the minimum high-quality basic features is the best way to build a consumer base. Create an offering that meets the minimum requirements for consumers, proves value and promises more features and enhancements with future development. Request feedback from your early adopters and assign a high value to what users have to say about the current product. What issues do they have with it? What needs have yet to be met? What ideas do they suggest for improvement? If you fail to listen to and truly consider the needs of your target audience, you won’t have an audience to cater to in the future because you’ll fail to keep up with their needs and wants. Combining market research and guidance from your users will drive product development, and your team of creators and engineers will experience less wasted effort and more useful insights on where to go from here. Beginning projects this way will not only get something valuable to consumers quickly (and perhaps faster than competitors) but will also establish a base or framework for utilizing resources and existing knowledge more efficiently. Traditional development techniques can lead to products three years in the making that fail to satisfy consumers and waste the investments of your team and stakeholders, which can then snowball to negatively affect your organization’s future growth. Operating on a minimum viable product approach means your vision will be shaped and informed by audience demand, guaranteeing a uniquely developed and tested solution that can withstand market changes and evolve with consumers' needs. Will you leverage the power of MVP to build a better business strategy? 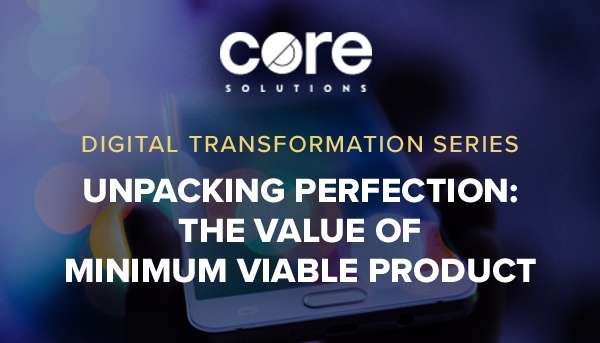 In putting the needs of our consumers first, Core Solutions has created an electronic health records platform using the principles of MVP, and we continue to evolve our work along with users for continuous improvement. Want to learn more about our EHR solution? Request a demo of Cx360 below to get to know our platform and how the Core Solutions team is working toward a better future for behavioral health. Core Solutions is the progressive leader in transforming the behavioral, medical and social services experience for behavioral health providers, consumers and state agencies. Core’s Integrated EHR platform, Cx360, allows for the improvement of the provider, consumer and payer relationship through increased consumer-centric collaboration which results in improved outcomes. This is accomplished through our ability to simplify the end-to-end HHS experience, deliver integrated care coordination, improve consumer engagement and streamline reimbursement processes. Subscribe to our blog today to receive the latest insights, news and resources for the behavioral health and human services communities!